for the dairy, food, beverage, pharmaceutical, biotech, biopharm,cosmetic and many other industries. Being a part of nature, we commit ourselves making sanitary and safety products to bring everyone a better life! but also the strictest inspection in every production phase. With such successful expereience, we bring our products with the following befinits to share with customers: more safety, lower cost, higher quality, long service life and better effiency. SANITARY STAINLESS STEEL TUBE FITTINGS ( 3A, IDF, DIN, SMS, RJT, BPE ) - Ferrule, Tube Clamp, Tube Support & Hanger, Tube Union, Flange, Elbow, Tee, Cross, Reducer, Gasket & O-ring, End Cap, Sight Glass ...etc. SANITARY VALVES - Butterfly Valve, Plug Valve, Check Valve, Ball Valve, Control Valve, Auto Valve( Compression Valve/Air-Actuated Valve ), Sampling Valve ...etc. SANITARY STAINLESS STEEL TUBES and SANITARY PUMPS...etc. 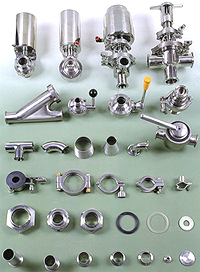 products are applicable to the Clean-In-Place( CIP ) process. Other customized or specified stainless steel products are available upon request, OEM/ODM manufacture are very welcome!